Difference in ‘Size on Disk’ and ‘Used Space’. Why? Huge difference in ‘Size on Disk’ and ‘Used Space’. Windows 10 1803. WD Blue 2TB HDD. There are no hidden or system files that can be seen like pagefile, hiberfile etc. But no idea about locked stuff like in 'System Volume Information'. But system restore is disabled in that drive. $RECYCLE.BIN should be empty as no files are there in recycle bin. I know that the sizes should be different. But 85 GB can be like 100 GB max. But 85 becoming 385 GB is very unusual. My other drives shows almost same size in both occasions. I had this issue some time before, therefore I moved all files I need to another drive, and formatted the E drive and moved those files again into the E drive from time to time. Migration is not fully finished yet. (Full size is 110 GB and moved only about 80 GB). As I remember, when I moved files, there was no huge difference. But after some time, I saw the drive in red color in explorer and found that same issue is there again. :/ .... But the thing is all the files that was in E drive are still there in D drive. D drive shows 110 GB in both size on disk and used space. Is it used space or unused space? Size on Disk (of all files) = 85 GiB. Total Size of E = 410 GiB. Used Space = 385 GiB. Free Space = 25 GiB. Run the disk management tool in windows, and post a screenshot. Sounds like an unallocated disk space/partition or an old windows installation or a compressed drive or something. I do not see such thing, i mean compared to other drives!... Here the screenshot. Run as Administrator, selecting only the drive in question. 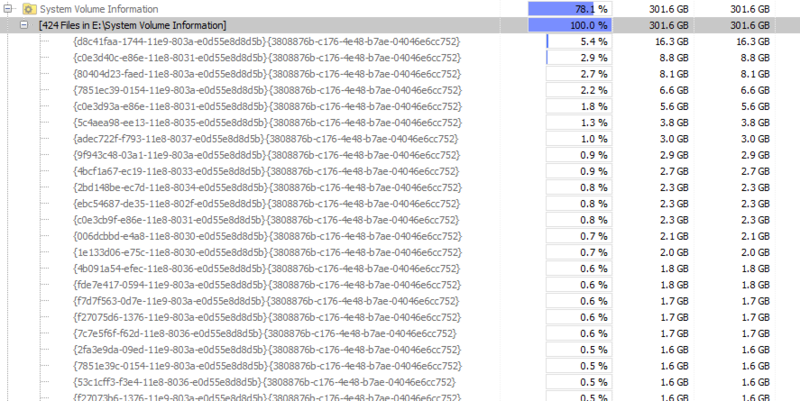 WizTree shows 301 GiB in System Volume Information Folder. All other folders show the actual amount : 85 GiB total. Inside it, there are big files of gigabytes. Why it is so big? I double checked now, System Restore is disabled for E drive. I think/thought that folder has files related to restore. Anything else stored there? Or does windows store restore files in other drives? Not sure what those are, but that's your missing drive space. Your drive setup is a bit odd, most people have the main C boot drive as Disk 0, and you have that chunk of almost 24gb just sitting there. Why do you have all those partitions on Disk 0? I would setup the system clean, remove the disks, plug in the main disk in the lowest SATA port so it's Disk 0. 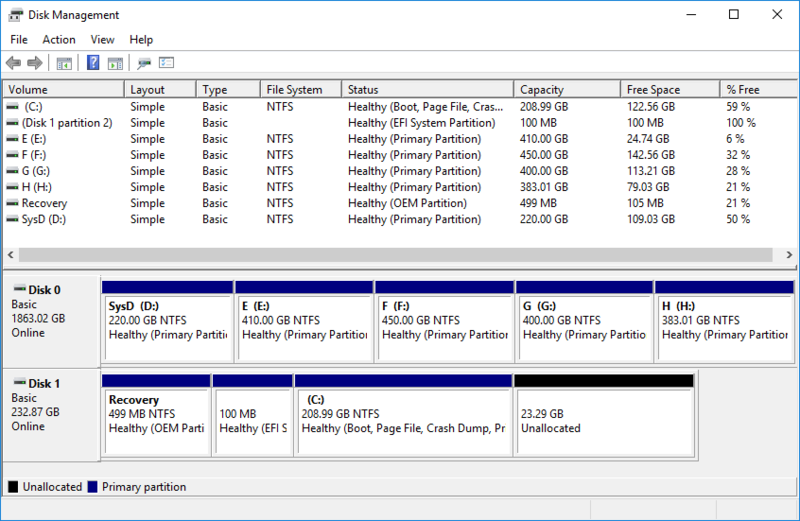 Do a clean Windows setup with wiping all the existing partitions. Then backup the second disk files to a backup drive, delete all the partitions and create a single one. That will clean up any funny space issues and make the system a lot neater and setup better. see if you have system protection enabled for drive E:. In my experience, missing hard drive space is often used up by restore points. Would I benefit to partition my drive with different allocation unit size for games, etc?